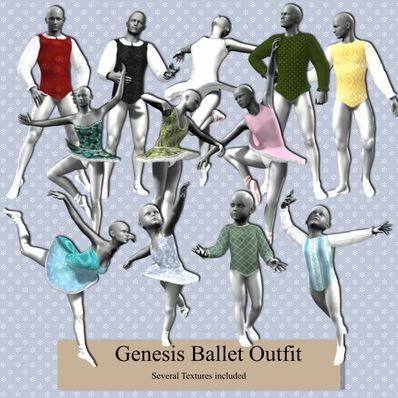 A Ballet Outfit for Genesis for use in Daz Studio 4. Male & Female Outfits included. Fit all items to Genesis, but set the Collision Iterations for the Top skirt to the Underskirt, to prevent poke through. Tights are just a colour texture added to legs. Thank you so much for the male and female ballet outfits, you are very thoughtful for including both versions. Genius thinking of using colour texture for the legs, never thought of doing that.